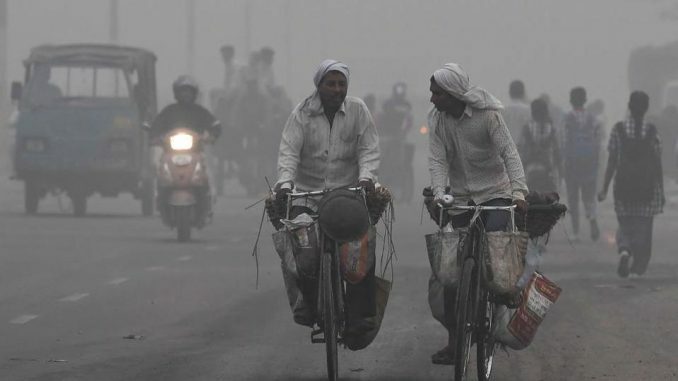 New Delhi: The quality of air across the Indo-Gangetic belt plunged on Monday night and continued to remain very poor on Tuesday morning as stagnant wind speeds prevented particulate matter or very small pollutant particles from being flushed out of the region, an expert said. Southern India, on the other hand, is enjoying a spell of good air partly driven by settling of pollutants due to northeast monsoon showers. This, however, may be translating into worse air quality for north India, D Saha at the Central Pollution Control Board’s Air Laboratory said. “Moisture from the south is entering the north and trapping pollutants near the surface,” Saha said. According to the CPCB, individual stations in Delhi and the National Capital Region recorded Air Quality Index (AQI) as high as 446 at 9.30am. Out of 19 monitoring stations in NCR, 12 recorded severe air quality. Delhi was one of the worse with an AQI of 397, inching towards the severe category with air quality between 400-500. In Uttar Pradesh’s Moradabad, air pollution levels are threatening to go off the charts with AQI of 478, as per data from the CPCB. The national capital also witnessed a cold foggy morning on Tuesday with visibility dropping to 200 metre at 8.30am. Saha also said what Delhiites experienced in the morning was fog and not smog because of low levels of sulphur dioxide. The other major factor was crop burning in the states of Punjab, Haryana and Uttar Pradesh, that will persist for the entire winter season. Noida and Ghaziabad also witnessed hazardous levels of pollution in the past 24 hours and it is unlikely to get better. Moradabad is the hub for waste recycling, in particular, electronic waste, and pollutants from improper disposal practices feed into poor air quality. The still air has made the problem worse with PM 2.5 levels recording a sudden jump to over 600 µg/m3 (micrograms per metre cube), over 10 times the prescribed limit. Exposure to these levels of pollution over a long time causes respiratory problems especially for people with lung and heart disease.